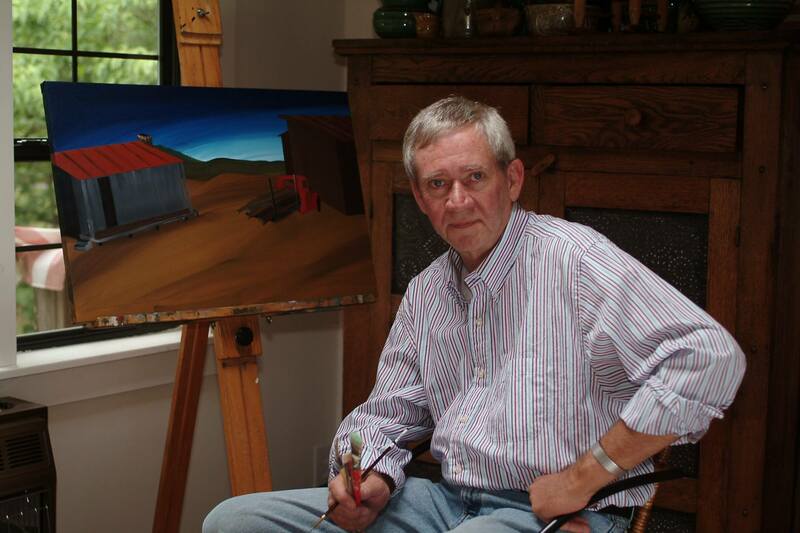 KENNETH EDGAR WOODALL was born in 1942, the last of six children, in a small community in rural northeast Georgia, known as Pea Ridge. When I was four, my family moved to Cornelia. My parents bought a grocery filling station cafe which we operated until my late teens. I grew up differently from most children in that we all contributed to the family business beginning at a very early age. We stocked the store, ordered merchandise, pumped gas, and minded the store. In my teens, while attending school, I worked for a local radio station as a DJ. I had an interest in art at a very early age. I liked to draw comic strips, paint by numbers, and paint toys. One of my early goals was to be a cartoonist, but of course, that never happened. After high school, I went to Piedmont College, the University of Georgia, and Truett McConnell College, and I studied a wide variety of subjects including journalism. At the age of 23, I went into business by purchasing a drive-in theatre which I operated for 25 years. As the theatre business declined I closed the theatre in 1987. From there I have worked with a car dealership and as a sales representative for a recreational equipment manufacturer. While traveling the highways and byways of the Carolinas and North Georgia as a salesman, I had time to observe and rekindle an interest in the Americana which had always fascinated me. This led to my collections of advertising memorabilia, and neon in particular. With the raising of my family completed, I additionally had more time to pursue my almost forgotten fascination with art. I began with three-dimensionals, depicting old theatres, houses and the family service station. Public acceptance of my work encouraged me to begin painting as well. Almost all of my commissioned works, such as a painting for the Ty Cobb family, are based on others’ memories. I paint at home in the North Georgia Mountains and at a cottage in Maine. My inspiration comes from my home in the southern Appalachians. With paint on canvas I tell tales of life in the 1950's and 60's. Through my artwork I hope to elicit an emotional response from my audience, perhaps a smile, a laugh or a tear.